Are you seeing safensecure.xyz pop-ups in the Chrome, Firefox, IE and MS Edge every time you use the web-browser to surf the Internet? This means that your PC is infected with an adware which looks the entire traffic generated by you and on this basis, it popups a lot of of annoying ads. Currently, this adware are widely spread, due to the fact that most people are trying to find freeware, download and install them on the personal computer without proper attention to the fact that the adware can penetrate into the computer along with them. Most often, the adware affects the most common web-browsers such as Chrome, Firefox, IE and MS Edge. But such the malicious software as well may infect another browsers by changing its shortcuts (adding an argument like ‘http://site.address’ into Target field of a web-browser’s shortcut). So every time you open the browser, it will redirect to the annoying safensecure.xyz web-page. Even if you setup a new startpage, an annoying site will be the first thing you see when you open the Chrome, Firefox, IE and MS Edge. What is more, the adware may open advertisements depend on a web-page that you are visiting. That is, it is clear that this adware, without your permission, steals your private information such as: your ip address, what is a web page you are viewing now, what you are looking for on the Internet, which links you are clicking, and much, much more. The adware may monetize its functionality by collecting data from your browsing sessions and selling it to third party companies. This puts your personal information at a security risk. 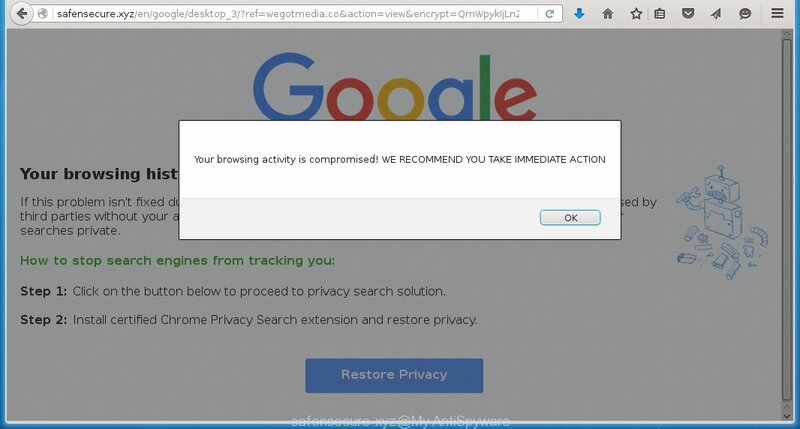 Therefore it is very important to as quickly as possible follow the step-by-step instructions below to remove adware and clean your PC from the redirect to safensecure.xyz ads. What is more, the guide will help you delete other dangerous software such as unwanted toolbars and browser hijackers, which could penetrate the computer along with the adware. Probably, the adware get installed onto your computer when you have installed a freeware like E-Mail checker, PDF creator, video codec, etc. Because, most commonly the ad supported software is bundled within the installation packages from Softonic, Cnet, Soft32, Brothersoft or other similar sites. Even removing the program that contains an adware, does not help you remove the safensecure.xyz ads. Therefore, you must follow the step-by-step guide below to delete all annoying advertising. If you perform exactly the instructions below you should be able to remove the safensecure.xyz advertisements. Read it once, after doing so, please print this page as you may need to close your browser or reboot your PC system. The best way to begin the PC system cleanup is to remove unknown and suspicious software. Using the Windows Control Panel you can do this quickly and easily. This step, in spite of its simplicity, should not be ignored, for one simple reason, many freeware at its installation additionally set various unneeded applications that most often generate annoying advertisements and redirect your browser to safensecure.xyz site. So, remove the unneeded applications may cleanup your internet browser from popups, hijackers and so on. Click the right mouse button to a desktop shortcut which you use to open your internet browser. Next, select the “Properties” option. Important: necessary to click on the desktop shortcut for the web-browser which is redirected to the safensecure.xyz or other annoying site. Further, necessary to look at the text which is written in the “Target” field. The ad supported software can replace the contents of this field, which describes the file to be run when you open your browser. Depending on the internet browser you are using, there should be: Google Chrome: chrome.exe, Opera: opera.exe, Firefox: firefox.exe, Internet Explorer: iexplore.exe. If you are seeing an unknown text like “http://site.address” that has been added here, then you should remove it, as shown on the screen below. Click the “OK” button to save the changes. Now, when you start the internet browser from this desktop shortcut, it does not occur automatically redirect on the safensecure.xyz web site or any other annoying web sites that is advertised by the ad supported software. Once the step is finished, we recommend to go to the next step. Run Microsoft Internet Explorer, press . Click “Internet Options” as shown below. In the “Internet Options” screen select the Advanced tab. Next press Reset button. The Microsoft Internet Explorer will display the Reset Internet Explorer settings prompt. Select the “Delete personal settings” check box and press Reset button. You will now need to restart your personal computer for the changes to take effect. It will restore the Microsoft Internet Explorer’s settings to default state, disable ad-supported browser’s extensions and remove the redirect to the safensecure.xyz annoying web-site. We recommend using the MalwareBytes Anti-malware Free. You can download and install MalwareBytes Anti-malware to detect safensecure.xyz threat and remove it, by clicking the download link below. When installed and updated, the Anti-malware will automatically scan and detect all threats present on the computer. Once installed, the MalwareBytes Anti-malware will try to update itself and when this task is done, click “Scan Now” button to perform a scan of your PC system. During the scan it will detect all threats present on your PC system. In order to remove all threats, simply press “Remove Selected” button. The Anti-malware is a free software that you can use to remove all detected folders, files, services, registry entries and so on. To learn more about the MalwareBytes Anti-malware, we recommend you to read and follow the instructions or the video guide below. To increase your security and protect your computer against new annoying ads and malicious pages, you need to use an application that blocks access to dangerous advertising and web sites. Moreover, the software can block the display of intrusive advertising, which also leads to faster loading of web pages and reduce the consumption of web traffic. In most cases, the default settings are enough and you do not need to change anything. Each time, when you start your personal computer, AdGuard will run automatically and block pop-up ads, sites such safensecure.xyz, as well as other malicious or misleading web-sites. For an overview of all the features of the program, or to change its settings you can simply double-click on the icon AdGuard, which is located on your desktop. If MalwareBytes Anti-malware cannot remove the redirect to safensecure.xyz advertising, then we suggests to use the AdwCleaner. AdwCleaner is a free removal tool for adware, browser hijackers, PUPs, toolbars. Also you can ask for help our Myantispyware team below. Double click the AdwCleaner icon. Once this tool is started, press “Scan” button to perform a system scan for the adware that generates the safensecure.xyz ads. If you are seeking a help for safensecure.xyz advertisements removal then follow these steps. Wait for one of our trained “Security Team” or Site Administrator to provide you with knowledgeable assistance tailored to your problem with the redirect to the unwanted safensecure.xyz advertisements.